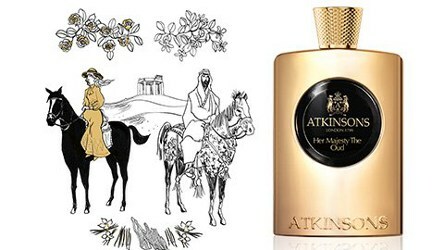 British perfume house Atkinsons has launched two new fragrances: Her Majesty The Oud and His Majesty The Oud (and see also: 2013's Oud Save the King and Oud Save the Queen). Her Majesty The Oud ~ "Everyone called her Khatun, from camel riders to emirs. But in London the bold heroine of our latest perfume was known as Gertrude Bell. English adventuress, archeologist, and diplomat of the Levant, Miss Bell was Our Woman in Baghdad during the Empire’s prime. In this rich spicy-sweet evocation of oud we travel with Miss Bell as she did, on horseback through the burning deserts of Mesopotamia alongside tribal horsemen in embroidered cashmeri robes. Like her, this deliciously womanly and nomadic fragrance laces together Orient and Occident, mingling precious Turkish Rose-infused oud with the afternoon high tea delights of sweet red berry and apricot-scented osmanthus flowers. An intrepid leather accord of saddle and bridle softly rounded by the powdery florality of iris and a desert whisper of vanilla expresses the Victorian elegance of this adventurous horsewoman." His Majesty The Oud ~ "The smoky power of His Majesty The Oud is every bit the bold equal of its protagonist, King Faisal I. Confidante of Gertrude Bell, and trusted ally of Lawrence of Arabia, Faisal was a natural leader and a legendary figure of Arabian history. Of princely Bedouin lineage, he fought, charmed, and negotiated with brilliance. His charisma and fierce elegance are perfectly matched in what can only be described as an epic fragrance. The intense smokiness of the scent is the bold alliance of a rare and exclusive quality of natural oud essence from Laos together with an exceptionally complex lapsang souchong tea accord. Conjuring up the scent of the saddles of Arabian stallions, the Lapsang Souchong accord inprints [sic] its smoky and leathery nuances onto the voluptuous woodiness of Cedarwood & Sandalwood, Surrendering only to the hypnotic aura of Oud and vanilla." Atkinsons Her Majesty The Oud and His Majesty The Oud are available now at Harrods in the UK, in 100 ml Eau de Parfum, £150 each.